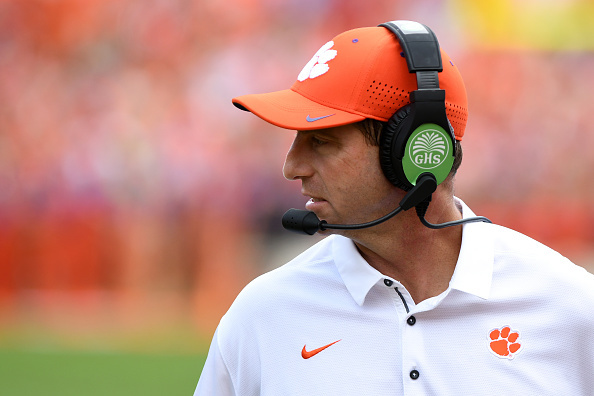 Those were the words Clemson coach Dabo Swinney used to describe Trevor Lawrence’s injury. The freshman quarterback took an extremely hard hit against Syracuse last Saturday. However, all appears to be fine now. Clemson dodged a major bullet. In last season’s game against Wake Forest, Kelly Bryant suffered an ankle injury in the third quarter. Both Hunter Johnson and Zerrick Cooper filled in admirably and Clemson held on for the victory. One week later with a banged up Bryant under center, Clemson endured its only loss in the regular season falling to Syracuse, 27-24. A year later, Clemson now finds itself in a similar predicament. And all three quarterbacks from last year have transferred out of the program. What’s left are two very talented freshman. Lawrence was one of the most highly rated quarterbacks ever to come out of high school. While Chase Brice was your average four-star quarterback recruit that most schools would dream of landing. Who knows if Brice won’t end up being the next Clemson star quarterback to transfer out of Death Valley? Probably. But on Saturday, Swinney was sure happy to have Brice in the program. “I’m telling you all this kid can play. I’m not surprised. When we recruited him, he was one of the top 15 quarterbacks in the country,” Swinney said. In the 27-23 win over Syracuse on Sept. 29, Brice and star running back Travis Etienne were pivotal in leading Clemson from ten points down in the fourth quarter. This week, Clemson travels to Wake Forest. After dropping games to Boston College and Notre Dame, the Demon Deacons bounced back with a 56-24 victory over Rice last Saturday. Wake Forest coach Dave Clawson knows the team is in for a big challenge on Saturday. You can’t get much more balanced on offense than Clemson Tigers. Through five games, the unit has averaged 253 yards through the air and 246 on the ground. Defensively, the Demon Deacons have been nothing short of a dumpster fire this season. After Notre Dame put up 56 points, Clawson saw enough and fired his defensive coordinator, Jay Sawvel on Sept. 23. Apparently, those frustrations had been building saying this “was not a spur of the moment decision”. So, how can Wake Forest pull off the upset? It starts with just how effective wide receiver Greg Dortch can be against the Clemson secondary after scoring four touchdowns against Rice. Ultimately, if Wake Forest cannot slow down the talented Etienne, it could be a long afternoon in Winston-Salem.